Earlier this month, I escaped the confines of my office to attend the hospitality design industry’s largest trade conference in the US, the Hospitality Design Expo, hosted each year in Las Vegas. It is one of the most comprehensive professional gatherings with more educational sessions and showcase events than you can possibly attend, and a spectacular ‘show and tell’ of all things design on the exhibit hall floor. One of the most impressive and important features of the Expo is by far the Radical Innovation Awards competition. I had the opportunity and the honor this year to sit in on the competition which was held live and decided by popular vote. The Radical Innovation Awards, now in its 9th year, was created and sponsored by The John Hardy Group, hotel development and construction management consultants. Designers love a competition and especially this one, with almost 100 entries submitted from around the world. Anyone that works in hospitality design, or follows it as fiercely as I do, knows that it is a moving target and it must move forward. This competition fuels that mission. Two finalists in the professional category (there is also a student competition,) were selected; the Hotel 2020; and the Green Air Hotel. 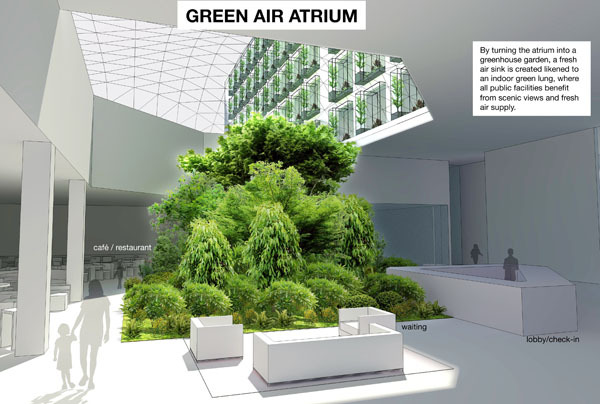 I was both moved and impressed by the presentation of the Green Air Hotel by Lip Chiong of Studio Twist, who won my vote as well as the competition. 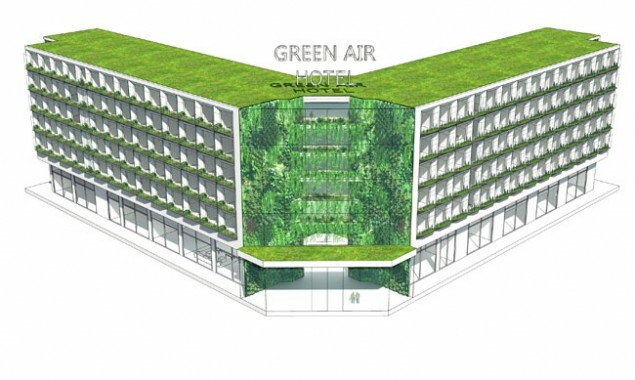 The Green Air Hotel transforms an outdated hotel building into a garden of greenery that breathes fresh air to guests and staff. Chiong refers to the Green Air Hotel as a “green lung,” providing fresh air to improve indoor air quality, enhance the guest experience, and to provide a healthier work environment for staff. 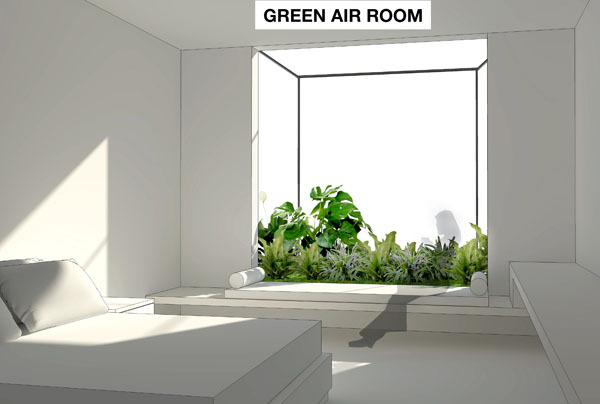 His design solution, in simple terms, is to replace toxins with oxygen, using plants as an air filter. China’s existing, under-performing buildings can be retrofitted, an inherently green concept itself, with a sophisticated system of planted walls, window wells, and atriums. The larger installations filter air in the hotel lobby and adjoining spaces, and mini versions are installed on the exterior walls of the guest rooms, creating a green facade, literally. Other areas in the hotel are considered such as hallways and occupied spaces that otherwise receive light. 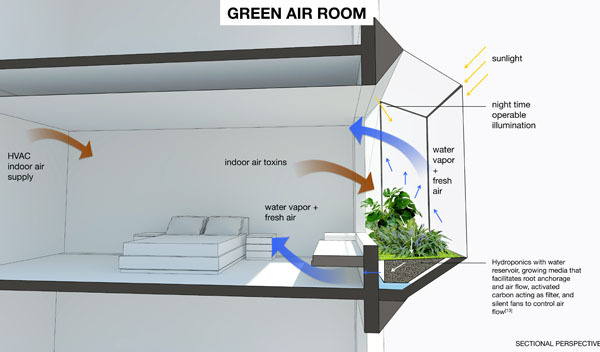 The filtered air generated from the plants, possibly eliminating the need for HEPA filters, can be circulated by the building’s mechanical system. Of course, in order for this to work effectively, the selection and placement of plants is precise. Only plant species that work well indoors are selected such as those commonly found in dense, shady, tropical forests. Orientation to optimize incoming daylight is integral to the success and longevity of the planted systems. Let Mother Nature’s natural air filter help you get a healthier, good night’s sleep. Out with the bad air, in with the good air. It’s that simple. Both the jury and the guests at the this year’s Radical Innovation Awards saw this as a viable short term solution that addressed a current real life issue. 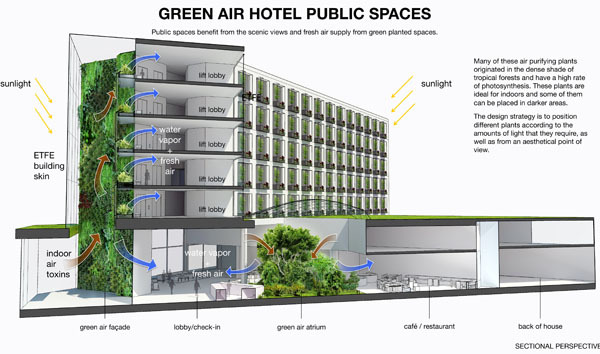 Although one juror, who spoke for many of us, acknowledged he can’t grow a plant, the Green Air Hotel, is an idea whose time has come. So, hoteliers and designers, take a deep breath and go for it.